So much going on, but family has to come first. Enjoy the time with your Dad and grandchildren. Your crafty friends will be here when you are ready and will appreciate your projects even more. This one has lovely flowers, which match that background paper perfectly. These are so gorgeous, Sherrie!! I love the beautiful papers!! The flower design looks amazing!! I love that they look so dimensional but they are flat enough to mail!! Stunning cards, my friend!! I love them!! And thanks so much for playing along at DL.ART!! Hang in there and know you've been missed! Pop in when you can but like the others have expressed ... Family Comes First ... Always!! 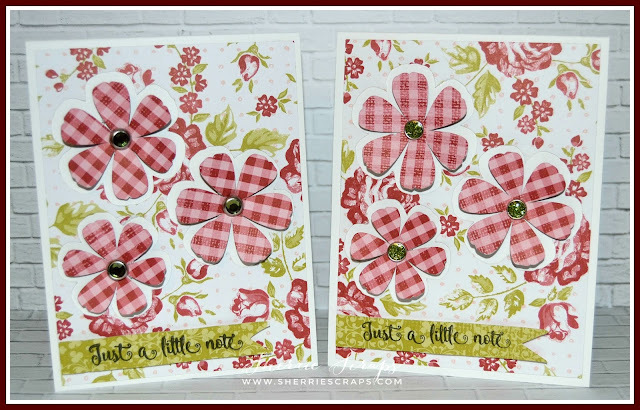 Sherrie, your cards are marvelous! I love to stamp flowers on patterned paper, and the gingham you selected is pretty. 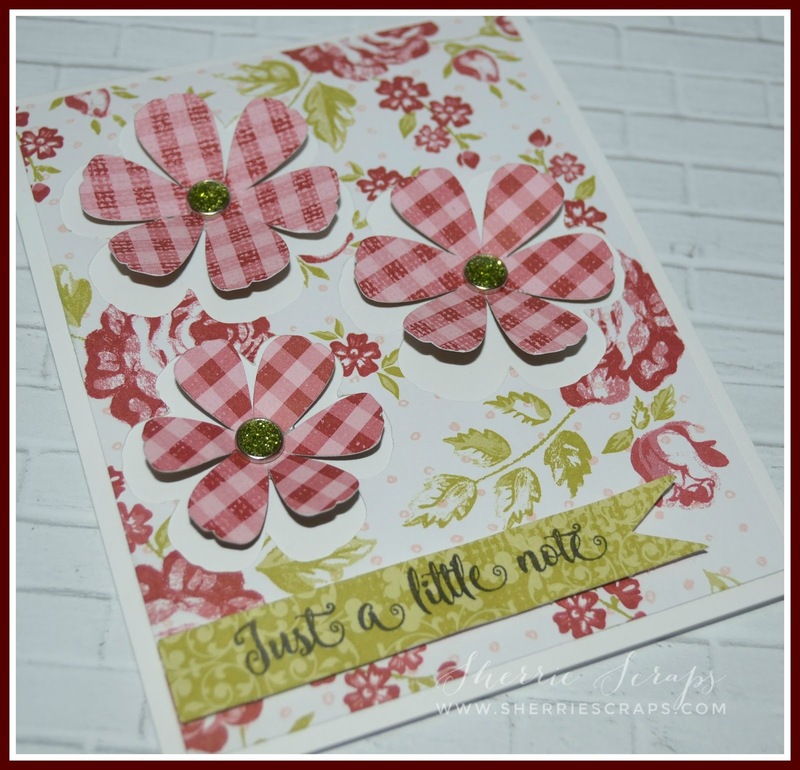 The die cut flowers and stamped blooms work together well! So glad you joined the challenge at Jo's Scrap Shack this week. Sherrie, your plate is full to overflowing!!! At least one day a week is what you need to do what you enjoy. God has your Dad and all will work out. He will be in my prayers. Your card is just beautiful!! Love, love, love the flowers and colors!!! Sherrie family comes first. Spending time with family is the greatest gift of all. WOW 2 new babies how exciting. Love you cards. Love how you just the big bold flower print behind the flowers really makes them pop. Love this so much I may if you don't mind scrap lift it. Hope you are able to get your 1 day a week in, but if not no worries we will all be here when you do come back. Hi Sherrie! I'm so glad to see you here but totally understand why it is difficult for you right now. Congratulations on the new grandbabies...enjoy that time and if you get to be crafty, wonderful! If not...you are doing exactly what you need to do right now! Take care! Hang in there sweet lady! Your family has to come first and remember to take care of yourself too! Enjoy your little grand babies, they grow up so fast! Your cards are absolutely gorgeous! I love those pretty flowers and the beautiful papers! Have a wonderful day! Congrats on the new grandson! I love his name!!! And still praying for your dad!! I love love love love your card!! GORGEOUS colors!!!!!!!!!!!!!!!!!!!! Very pretty!! I love the pattern flowers. Thanks for sharing at Pause Dream Enjoy Challenges. Oh these are so pretty that paper is gorgeous! I'm glad I'm not the only one who hoards paper. So sorry about your dad, it is so hard to see them struggle so much. I am going through the same thing with my dad right now. But happy news about Oliver and another one coming! Grand babies are the best! How fun (and exhausting) for you to get to spend 2 days a week with the girls! Wow! You do have a lot going on my friend. I would be exhausted too! I really like your little card, so cute! I'm so happy you found some time for yourself to get into the craft room. Your cards are so pretty and great papers to 'have' to use up! I was thinking that very same thing when I was in the Closet today. What will I do with all this DP? Your family continues to be in my prayers, and I am praying that you will be able to find balance in your life. Good for you to spend time with your new grandson. I am exhausted just hearing all that life is throwing your way! Sending big hugs! Your cards are beautiful! And yes they would even look great in a pretty box too. Lovely colors & patterns. I completely understand spending time with the family and everything that you & your family have been going through.Take your time and rest a little as well. The lord has your dad & your family covered in prayers. This is absolutely DARLING! Thanks so much for sharing with us. Please stop by again soon. 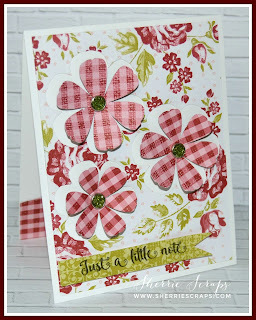 You know, this would be a great card to share in the current challenge at Paper Sweeties. You would really LOVE the adorable stamps, dies, etc. they carry; and there's always a fun challenge where you can possibly win a $25 gift certificate and chance to Guest Design. This card would be sweet in the current challenge, and I hope you will link up. So, so pretty! I love the sweet gingham flowers! I know you must be pooped my friend! You certainly are dealing with a lot right now. I hope that your Dad's condition will improve and he will adjust to the physical changes in his life. Enjoy all of those beautiful grandbabies and keep us posted on the new addition! Oh so Pretty Sherrie! I think I still have that same paper pack! LOL It's crazy the paper we hoard! :) I'm happy to see you finding some "ME" time in the midst of all the chaos! :) I'm super excited for your new grandson and then another grandbaby on the way (exciting)... your family is growing like a weed! I pray for your dad daily... I know this can't be easy on him or the family... I hope he can adjust to the difficult changes that have happen to him... My husband still has trouble with his changes... and it's been 13 yrs. since his strokes... I say Strokes with an S... because he ended up having several over a course of a month & a 1/2.... It's still difficult for him after all this time.... That's why I pray so hard for your family... it's not easy on the person it happen to or the family members who have to help deal with the aftermath of this awful thing that occurred to him.... BIG HUGS!!! Stay Strong! WOW!!! Sherrie, super fun Happy card I love the flowers and you color and design. Oh wow these are so pretty Sherrie!!!! Love those gorgeous papers! The patterns are gorgeous!!!! I too, have a ton of older papers and I just use them up when I feel like it. I don't let it bother me anymore.. I use what is in my stash already than to try and keep up with all the new trendy stuff. I would go broke for one thing and second of all, the papers we do have that are "Old" or "outdated" were once beautiful to us ... as we did buy them afterall... and they are still "new" to us... so I say just don't sweat it and use it up! Really hope that your father is doing better ... it saddens me so much that he lost his vision... I pray for you all so much... and congratulations again on becoming a grandmother again! I am sure little baby Oliver is bringing you so much joy.. being the first boy and all! Looking forward to hearing all about the next newest little grandbaby to come into the world! Thanks for linking up these beautiful cards in our FFC and I hope you have an amazing week ahead! Sherrie, I remember this paper pack from SU! and I actually still have some of it left in my stash too! What a great way to use up smaller paper scraps that are just too pretty to get rid of! 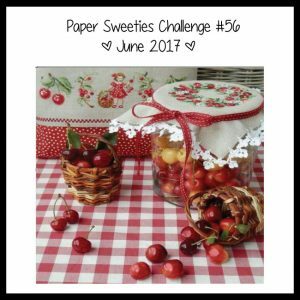 Thank you so much for sharing your beautiful card with us for the Paper Sweeties June challenge - please be sure to link back to our challenge in order to be eligible for the prize!! Congrats on your new little grandson! It sounds like a very busy time. I love checking out your sweet projects on your blog- your cards turned out beautifully! I am glad you got some time to craft. A great stress reliever. Congrats on the new grandson-Oliver. I hope your dad is recovering-and adjusting to losing his vision. Have a great evening. These are so sweet! 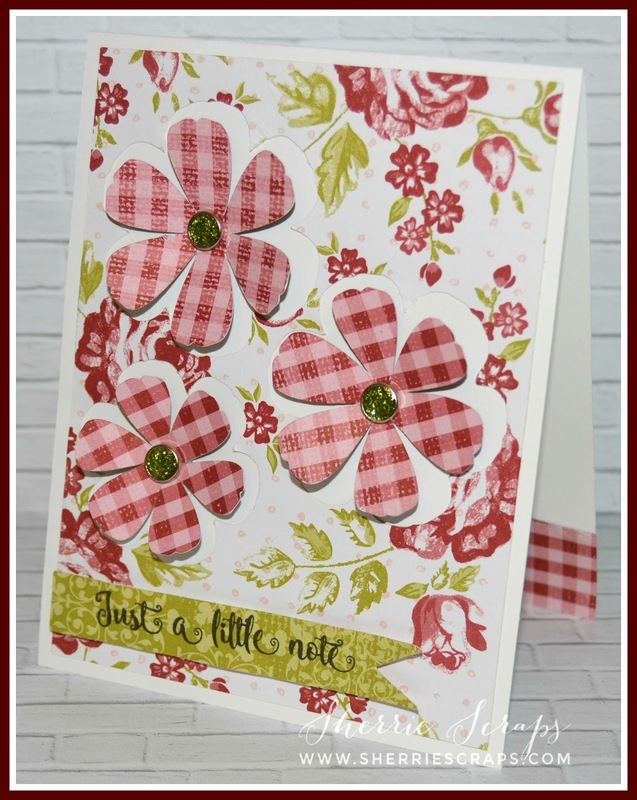 Love those die cut gingham flowers! What a warm and cozy homespun vibe! Congrats on your new grandson, Sherry! You sure are busy!